The eternal scent of Italian elegance, power, sophistication and integrity wafts out of Trussardi My Land Eau de Toilette for Men, together with an intense sensuality. This is the scent of virile, active and successful men. 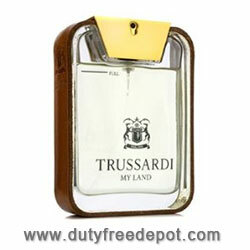 Trussardi My Land Eau de Toilette for Men's fragrance is characterized as classical and modern woody - fougere that captures the power of woods surrounded by sensual leather. The compositions opens with citrus notes of green mandarin and bergamot, leading to the heart of lavender, violet and Calone molecule that provides a fresh and marine note. The base is one that is dominant, with its intense accords of leather, vetiver and tonka bean.